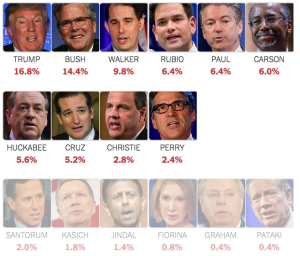 Only 10 of the 16 Republican presidential candidates will be allowed into the first debate, on Aug. 6. Fox News, which is hosting the debate, will winnow down the list using an average of the five most recent major national polls. The list above represents our estimate of the current ranking, based on the most recent polls and the rules published by the network. Some big names – potentially including a sitting senator and current or former governors of Texas, Ohio, Louisiana and New York – will be left out. And the dividing line will depend partly on both random chance and subjective decisions.